Adopted on July 21, 1967. On July 21, 1967, the mineral galena was adopted as the official mineral of Missouri. Galena is the major source of lead ore, and the recognition of this mineral by the state legislature was to emphasize Missouri's status as the nation's top producer of lead. Galena is dark gray in color and breaks into small cubes. 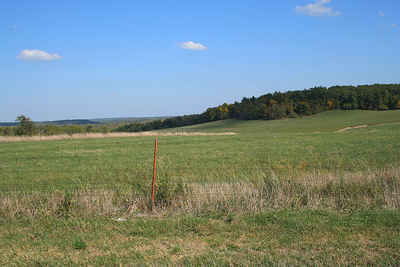 Mining of galena has flourished in the Joplin-Granby area of southwest Missouri, and rich deposits have been located in such places as Crawford, Washington, Iron and Reynolds counties. (RSMo 10.047) . 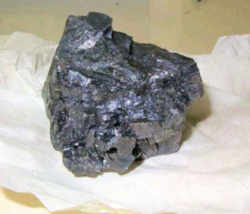 Galena is the primary ore mineral of Lead. Worked for its lead content as early as 3000BC, it is found in ore veins with Sphalerite, Pyrite and/or Chalcopyrite, and in Sedimentary rocks as beds or impregmentations. 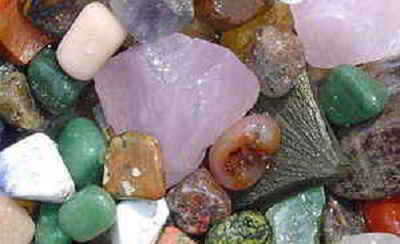 The crystals are bright when fresh but often receive a dull tarnish after exposure to air. 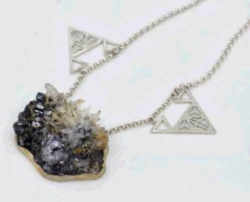 Galena is a common and popular mineral for rock hounds. Its characteristic cubes, distinctive cleavage and high density make it easy to identify and a favorite in high school geology labs. The structure of Galena is identical to that of halite, NaCl. The two minerals have the same crystal shapes, symmetry and cleavage. Some Galena may contain up to 1% silver in place of lead. The large volume of Galena that is processed for lead produces enough Silver as a by product to make Galena the leading ore of Silver. Galena (lead) What starts our cars? About 80 percent of mined lead goes into making vehicle batteries. Approximately 1,000 pounds of rock containing galena must be mined a processed for the 30 pounds of lead in each car battery. Lead is also used in our televisions and computer screens because lead stops radiation. Lead is not used in pencils. Pencils are made from another mineral called graphite. Approximately 90 percent of lead produced in the Untied States comes from Missouri, ranking it first in the nation. Also, the largest smelter, a large processing facility that gets lead from galena, is located in Missouri. Galena, also called lead glance, is the natural mineral form of lead(II) sulfide. It is the most important ore of lead and an important source of silver. Galena is one of the most abundant and widely distributed sulfide minerals. It crystallizes in the cubic crystal system often showing octahedral forms. 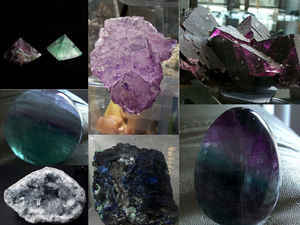 It is often associated with the minerals sphalerite, calcite and fluorite. Color is lead to silver gray sometimes with a bluish tint. Luster is metallic to dull in weathered faces. Crystal Habits include the cube, octahedron and combinations of the two. Spinel twinning is possible forming flattened crystals. Also massive and granular. Cleavage is perfect in four direction forming cubes. Fracture is uneven and rarely seen because of the perfect cleavage. Associated Minerals are calcite, dolomite, sphalerite, pyrite and other sulfide minerals, also lead oxidation minerals such as cerussite and anglesite. Other Characteristics: brighter metallic luster on cleavage surfaces than on crystal faces. Notable Occurances include Texas-Oklahoma-Missouri area, USA; Germany, Peru, Mexico, Zambia, and England. Best Field Indicators are crystal habit, cleavage and, perhaps most importantly, density. 10.047. The mineral "galena" is the official mineral of Missouri.